To take your mind off whatever tsuris you may be feeling about our nation hurtling toward anarchy, for the third year in a row we take you briefly back to Sunday’s state of guacomole-induced stupor, to compare critics’ reviews of the all-important Super Bowl ads. And once again we realize that John Wanamaker was right: 50% of advertising is wasted. Unlike Mr. Wanamaker, in this case we have a pretty good feeling about which 50% may have been involved. 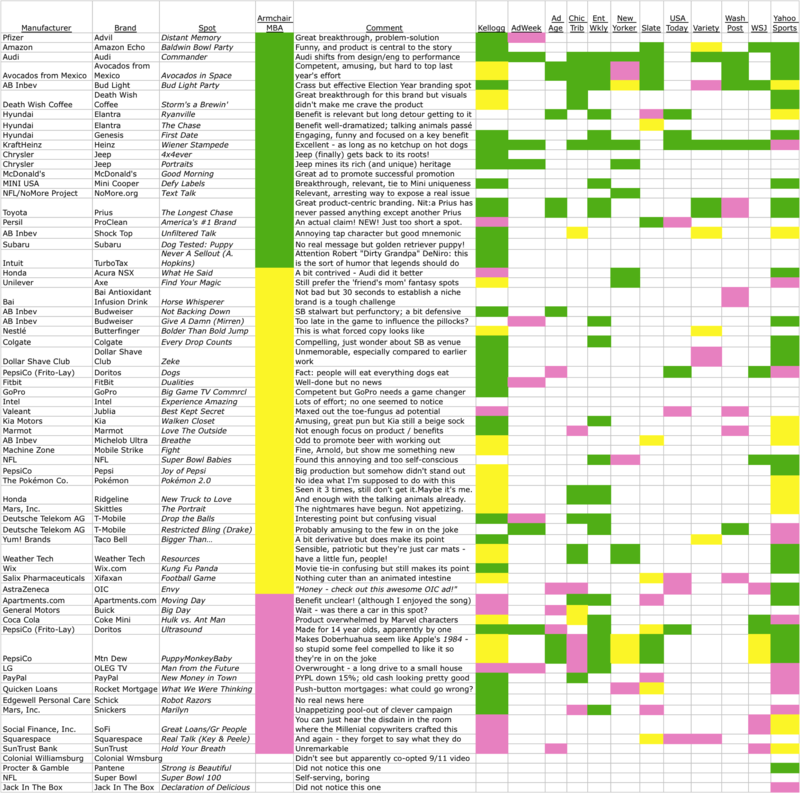 At the bottom of this post is a remarkable chart comparing major reviewers (color-coded green/yellow/pink) for all the spots run during Sunday’s game. It’s pithy! NOTE: ads are grouped by my rankings of green/yellow/pink but are alphabetically listed within those large groups. First of all, if Super Bowl 50 was such an amazing success, why were there approximately 260 CBS ads taking up valuable ad space? Finally, Weather Tech – this is I believe your 3rd Super Bowl ad. You make a great product in an admirable way. You are decent, hardworking, earnest people. But maybe it’s time to step away from the cheese dip and have a beer. Click once or twice on the table below to make it more readable. Posted in Branding, Marketing and Media, Marketing Strategy and tagged Acura NSX, ADPLAN, Advil, Amazon Echo, Amy Schumer, Ant-Man, Anthony Hopkins, Apartments.com, AstraZeneca, Audi, Avocados from Mexico, Axe, Bai, Bud Light, Budweiser, Buick, Butterfinger, Calkins, Christopher Walken, Chrysler, Coke Mini, dachshunds, Dollar Shave Club, Doritos, Drake, Fitbit, GoPro, Horse Whisperer, hot dogs, Hulk, Hyundai, Hyundai Genesis, Intel, Intuit, Jeep, John Wanamaker, Jublia, Kellogg, ketchup, Key & Peele, Kia, Kraft/Heinz, LG, Liam Neeson, Marmot, McDonald's, Michelob Ultra, Mini Cooper, MINI USA, Mobile Strike, Mtn Dew Kickstart, mustard, NoMore.org, OIC, OLEG TV, Persil, Pfizer, Pokémon, ProClean, Puppymonkeybaby, Ridgeline, Ridley Scott, Rucker, Shock Top, Snickers, SoFi, Squarespace, Steve Harvey, SunTrust, Super Bowl, Super Bowl 2016, Super Bowl Ads, Super Bowl Commercials, T-Mobile, Taco Bell, Toyota Prius, TurboTax, valeant, Weather Tech, Wix.com, Xifaxan. Bookmark the permalink.